Morris County pets will be a little safer now that the Morris County Office of Emergency Management and Community Animal Response Team (CART) have obtained an AKC Pet Disaster Relief trailer, an emergency trailer that helps create a safe, temporary home-base for at least 65 pets immediately after a disaster is declared. 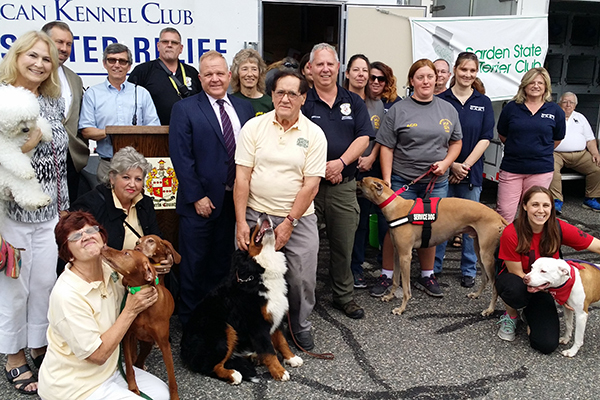 Combined with two existing animal transport trailers – purchased through federal and state emergency preparedness programs – Morris County now has the capability of securing some 200 animals in the event of an emergency or disaster situation. The purchase of the trailer was made possible by $22,000 in donations and grants from the Sussex Hills Kennel Club, New Jersey Federation of Dog Clubs, The Kennel Club of Northern New Jersey, Schooley’s Mountain Kennel Club, Twin Brooks Kennel Club, the Bichon Frise Club of Northern New Jersey, the Non-Sporting Group Club of the Garden State, the Keystone English Springer Spaniel Club, the Vizsla Club of Greater New York, the Garden State All Terrier Club, Kitty Steidel, the Scottish Terrier Club of Greater New York, the Pembroke Welsh Corgi Club of America, and AKC Reunite, the nation’s largest non-profit pet identification and recovery service. “The New Jersey Federation of Dog Clubs and all the other supporting clubs are dedicated to giving back to our community and helping our fellow citizens and their pets. 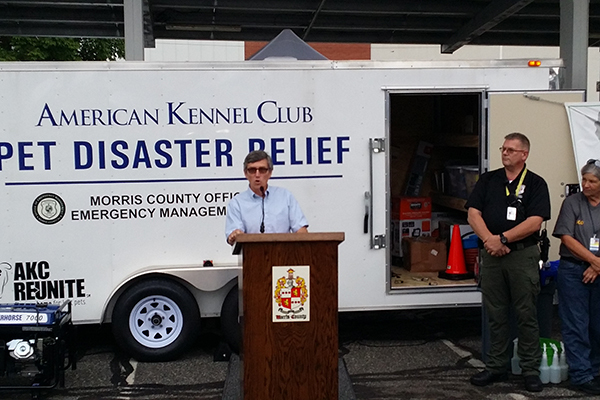 We’re very proud to help bring this AKC Pet Disaster Relief Trailer, which can provide meaningful support during the difficult times before and after a disaster, to Morris County,” said Jeffrey Ball, NJFDC President. 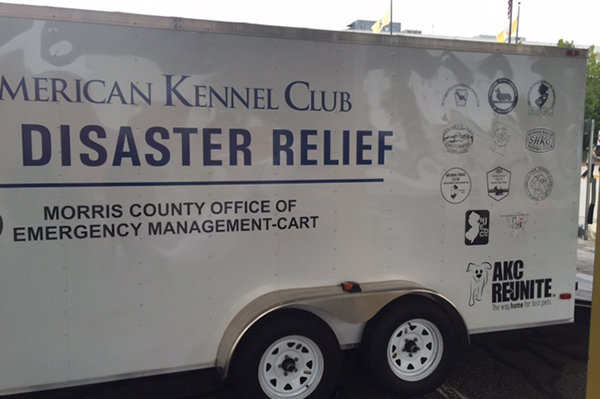 “Keystone English Springer Spaniel Club is very pleased to have been able to assist Morris County in obtaining the AKC Pet Disaster Trailer to help in keepings our pets safe in time of need or disasters,” said Tom Faust, Keystone English Springer Spaniel Club President. “Having this new trailer allows us to fully set up a shelter in an emergency and support our towns and even contiguous counties that don’t have adequate resources,’’ said Morris County OEM Deputy Coordinator and CART Coordinator Karl Klingener.